Let's say up front that though these canine breeds are going to have numbers next to them, every single dog and dog breed is No. 1 in our hearts. Not only are they all very good boys, indeed; they are the very best boys, indeed. So with that out of the way, let's talk about the numbers. Though Americans have a distinctly intense love of dogs, we don't spread that love equally between the (equally wonderful) breeds. On Wednesday, the American Kennel Club released its annual list of the most popular breeds, and there's a clear top dog. For the 28th year in a row, the Labrador retriever came in at No. 1. As AKC's Executive Secretary Gina DiNardo said in a statement, it "shows no signs of giving up the top spot anytime soon." Labrador retrievers set the record for longest at the front of the pack all the way back in 2013, but the beagle, No. 6 on the list, has been in the top 10 every decade since data started to be collected back in the 1880s. 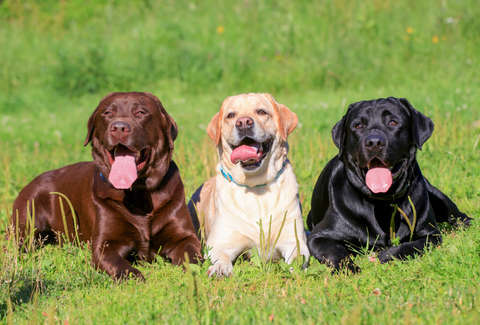 Close behind the Labrador retriever are German shepherds, golden retrievers, French bulldogs, and bulldogs, which probably doesn't surprise you from just seeing dogs around. More surprising is the German shorthaired pointer, which reached its highest position since becoming recognized back in 1930, jumping up to 9th place. The rarest breed, on the other hand, was the sloughi, a dog that's similar to a greyhound and has a history in North Africa but was only recognized by the AKC three years ago. If you've never heard of them, well, that makes sense. But no matter how rare the dog is, there's a pretty high chance its owners just named it Max.